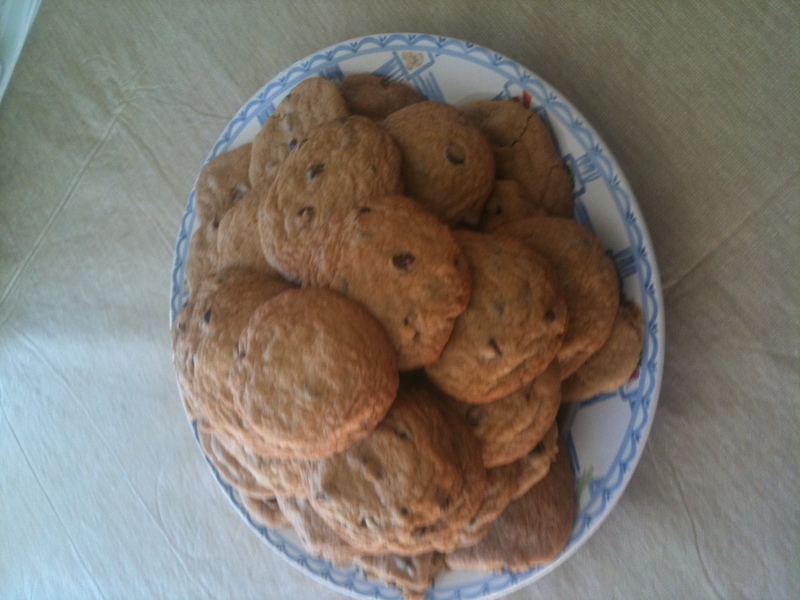 I think she’ll like the cookies – I didn’t try one, but my mom did, and she said they turned out very well (see the picture above). I’m pretty sure she knows what I did… I washed the dishes after baking, and when she unloaded the dishwasher I’m certain she saw the measuring spoons and cup, and later in the evening when she was setting the table she asked me where our other serving platter was. She simply accepted that I was “using it”. So, ladies, answer this question – would you prefer Carats or Cookies? Fellows, the recipie is on the side of Nestle’s Semi-sweet morsels, and on-line. Don’t wuss out and get the ready-to-bake cookies, the slice & bake tube of dough, and don’t get the tub of prepared dough – while all three have the same ingredients listed on the side, the tube & the tub are missing a vital ingredient, and if you don’t know what that ingredient is, well, I’m sure the Jewelry store at the mall still has a nice selection of reasonably-priced items.